Limassol (Cyprus), December 13, 2006 -- Prestigio Technologies Ltd., a dynamic international vendor of state-of-the-art products for Digital Home and Digital Office, today announced the release of an advanced widescreen 20-inch monitor Prestigio P5200W. 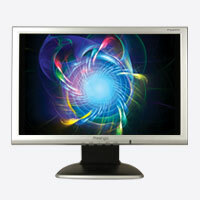 This stylish monitor features fast Glare Type panel with WSXGA+ resolution and expanded viewing angles. The new product is immediately available at Prestigio partners’ stores across the countries of Central and Eastern Europe, Middle East and Africa. The Prestigio P5200W is an ultra-stylish 20.1-inch widescreen LCD monitor designed to provide high graphics performance for office and home users. This next-generation LCD monitor is ideal for displaying complex graphics and high definition images, as well as for various everyday work and entertainment needs. It also enables users to benefit from new exciting Windows Vista ™ features, such as Windows Sidebar, which is a pane on the side of the Windows Vista desktop that organizes gadgets (mini-applications) that offer information at a glance and provide easy access to frequently used tools. This exclusive monitor offers a very fast panel with impressive 8 milliseconds response time, providing for superb video and gaming experience. In contrast to usual TN+ Film panels, the P5200W offers expanded viewing angles of 180 degrees, both horizontally and vertically, so users can enjoy crisp and clear images at any angle. The widescreen panel allows for comfortable display of large portions of text and image data, thus eliminating the need for scrolling when working with spreadsheets or editing big digital photos. It can accommodate two standard A4 size pages. Besides superior image quality, this model boasts of excellent contrast ratio of 600:1, very high WSXGA+ resolution (1680x1050), 16.7 million color capability, two built-in 3 Watt speakers, and outstanding price/quality ratio. In addition to the analog D-Sub connector, the unit is equipped with a digital DVI input providing for bright, sharp and vibrant images without distortions. The on-screen menu is available in many languages offering easy navigation and adjustment. On the outside, the Prestigio P5200W features strict business design with a classic combination of black and silver, and an elegant and stable space-saving stand. All Prestigio monitors are covered by 3-year international limited warranty.